During fall, the air is a little crisper, the leaves a little more colorful and everything is just a little more beautiful. 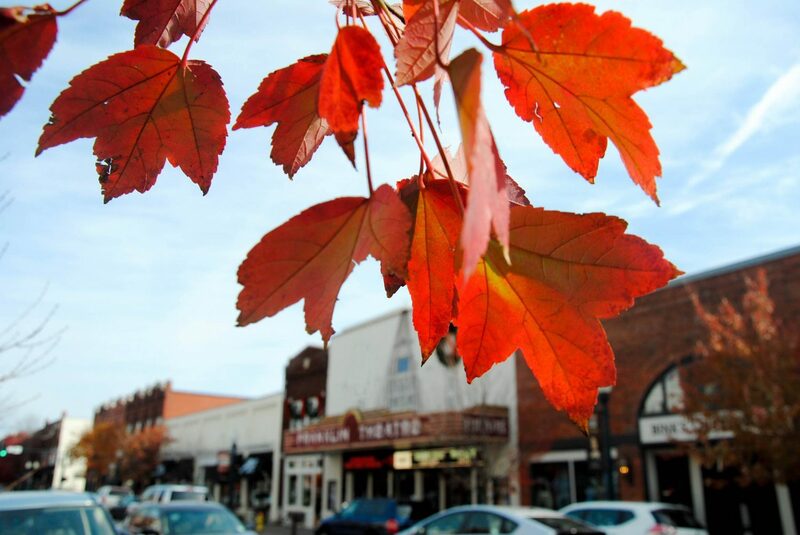 Make the most of the season by spending it in Downtown Franklin. Nothing says fall like Pumpkin Spice! Grab a pumpkin spiced flavored coffee at Frothy Monkey and Starbucks and begin your journey on America’s Favorite Main Street. The summer heat is gone and it’s time to enjoy the beautiful weather that fall brings. Scenic hiking trails are never far away from Downtown Franklin, but before you hit the trails stop by Bink’s Outfitters. Here you’ll find all of your outdoor clothing and footwear essentials. If staying indoors is what you have in mind, stop by the Franklin Theatre. This restored historic movie house has a full bar, concessions and entertainment galore. Not only can you enjoy the classic Ghostbusters in this historic theatre, but you can also join them for a Movie Gang Halloween Party on October 18! In addition to movies, you can mark your calendars for live acts such as American Idol’s Taylor Hicks and Jenna and Barbara Bush. Hungry? Then you are in the right spot! Choose from any of Downtown Franklin’s delicious restaurants for breakfast, lunch or dinner. If you’d rather make a hearty, homemade meal, find fresh, locally-grown vegetables, fruits, dairy and meat at the Franklin Farmers Market at The Factory. This year-round market boasts a wide selection from local farms, as well as several local artisans and arts and crafts vendors. Stop by on Saturdays from 8 a.m. – 1 p.m. to stock up on Tennessee farm fresh food. It’s never too early to get started on Christmas Shopping! In Downtown Franklin, you have plenty of options. Whether it’s clothing, home decor, stationary or jewelry, you can find it (and more!) on Main Street. Find the full list of shops here. Immerse yourself in Downtown Franklin’s rich history by touring one of the many historic sites such as Carnton, Carter House and Lotz House. There’s no shortage of fun, fall events. Stroll Main Street while admiring the work of local artists at the Franklin Art Scene on October 6. And you definitely won’t want to miss Pumpkinfest, Middle Tennessee’s largest family fall festival! On October 28, this free and festive event will be jam-packed with costume contests, live music, a new miniature golf activity and returning this year…the 2017 Chili Cook-Off! Enjoy and vote for your favorite chili located in the parking lot of Landmark Booksellers. No matter what you decide to do, you are guaranteed to fall in love with Downtown Franklin.